Snappy writing gives this history some “briefs” appeal, but it’s too scantily clad in specifics. “We all own it. We all wear it. We all wash it. (At least, I hope we do! 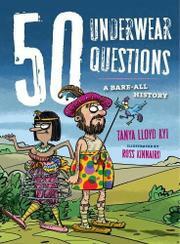 )” Lloyd Kyi follows up 50 Burning Questions: A Sizzling History of Fire (2010) with a like number of posers on styles and changing fashions of undies worldwide and through history—though her view of the topic is broad enough to include mentions of loincloths, chain mail and other items more often worn as outerwear. She slips from the goatskin garment worn by the prehistoric “Iceman” and the mawashi that Japanese sumo wrestlers sport to contemporary undershorts with pockets for cellphones and the “union suit gone cyber” that astronauts wear while spacewalking. As colorful as her general observations and terse anecdotes are, though, there isn’t much substance or system to her study—readers curious about the etymology of “skivvies” or “g-strings,” what the “bejeweled undershirts” that were outlawed in London at some unspecified time looked like or the nature of the athletic “technology” developed by Under Armour will be left in the dark. Even when she does go into detail about, for instance, farthingales or how the Papua New Guinea women’s maro displays marital status, instead of a helpful archival or other illustration, Kinnaird’s cartoon images supply only jokey filler.